(19687.TO.M002.61.2.1,, Chester R. Cowen Collection, OHS). (20579.TO.M002.52.2.2, Oklahoma Genealogical Society Collection, OHS). The seat of Pittsburg County, McAlester is located approximately in the center of the county, on State Highway 31 and at the crossing of U.S. Highways 69 and 270. In 1869 James J. McAlester opened a store in a tent at "Crossroads," a location where the Texas Road was crossed by one of the California trails. He was aware beforehand that there were coal outcroppings in the area. His store prospered, particularly after the Missouri, Kansas and Texas Railway (Katy) constructed a line nearby in 1872. The railroad dubbed the little station "McAlister" (spelling changed to "McAlester" by the U.S. Post Office Department in 1885). In 1872 J. J. McAlester married Rebecca Burney, the daughter of a prominent Chickasaw family, allowing him citizenship in the nation. This enabled him to acquire control over the area's valuable coal claims. In 1875 he and three partners leased the land to the Osage Coal and Mining Company, which was served by a spur from the railroad. This was the beginning of Indian Territory's coal-mining industry. The thriving little community of McAlester quickly developed, with a drugstore, hotel, livery stable, and at least three other retail stores. The 1890 population stood at three thousand residents. In 1889 an east-west railroad, the Choctaw Coal and Railway (later to become the Chicago, Rock Island and Pacific Railway), was built to serve the rich coal fields east of McAlester. That railroad intersected the Katy one and one-half miles south of McAlester, creating a new settlement that became known as South McAlester. Because of its advantageous location at the railroad crossing, it quickly outgrew the older town. By 1900 the comparative populations were 3,470 to 642. In 1899 both towns incorporated, McAlester in January and South McAlester in November. In 1906 the towns were combined into one with the name of McAlester. The older town became known as North McAlester. Since the former town of South McAlester was the larger, its city government took municipal control. Newspapers had served the town since 1893 when the Baptist Watchman first published. Three of the more prominent newspapers, the McAlester Capital, the McAlester Democrat, and the McAlester News, all eventually merged, the Democrat joining the others in 1978, creating the McAlester News-Capital and Democrat. McAlester was considered the capital of the rapidly growing coal industry in southeastern Oklahoma, which brought with it an influx of immigrant coal miners. Most of the original workers were of British extraction from the mines of Pennsylvania, but they were insufficient in number, so many more were imported from Europe. Italians were the largest number, but immigrants from Germany, France, Lithuania, Poland, Russia, the Slavic countries, Mexico, and other places also arrived. By 1900 McAlester's population was 25 percent foreign born. In other surrounding towns the percentage was even higher, making an ethnic mix in this area like no other in the state. Mining was not entirely responsible for the development of McAlester. A fertile area for farming and ranching surrounded the town, with cotton being the principle cash crop. Each outlying community had one or more cotton gins, and McAlester held three within the city limits, plus a cotton compress which could process as many as twelve hundred bales per day and forty thousand per year. 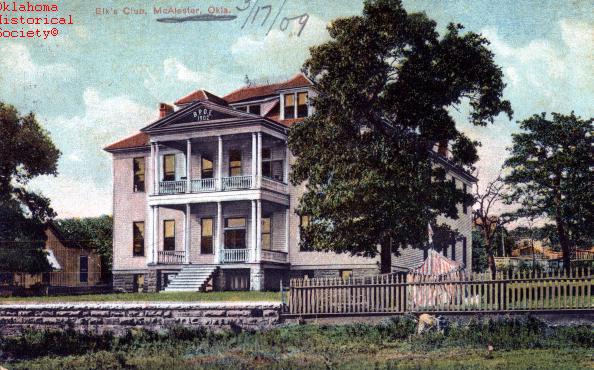 The 1895 establishment of a federal court in South McAlester attracted a number of attorneys, and the construction of the All Saints Hospital, one of the first in Indian Territory, lured competent physicians. The availability of railroad transportation in all directions made McAlester ideally situated for wholesale houses, businesses and stores of all sorts, and six banks. The population in 1910 was 12,954. It had schools, brick streets, good municipal water system, a macaroni factory, an ice manufacturing plant, a fine hotel, a theater, and a trolley system that connected McAlester with Hartshorne and all towns and communities in between. Business leaders predicted it would quickly double in population, but that proved false. The boll weevil almost completely destroyed cotton production, and by 1920 the railroads were converting to the use of oil as fuel for their locomotives, which almost destroyed the market for coal. That, together with the Great Depression, stalled McAlester's growth, and it did not see a large population spurt until World War II. The 1920 population was 12,095, slowly dropping to 11,804 in 1930 but rising to 12,401 in 1940. The U.S. Census reported 17,878 McAlester residents in 1950. In 1942 two large government projects strained the town's housing capacity. A prisoner-of-war (POW) camp was built adjacent to the northern city limits, and a huge U.S. Naval Ammunition Depot was constructed just a few miles south of town. The depot's construction phase employed fifteen thousand workers. The POW camp housed three thousand German prisoners for three years. The Naval Ammunition Depot, changed to the U.S. Army Ammunition Plant in 1977, was at the beginning of the twenty-first century the main location for the production and storage of ammunition for the armed forces in the United States. At the end of World War II local business leaders realized that the city's growth and stability should not depend on its two largest government employers, the ammunition plant and the Oklahoma State Prison, which had been established at McAlester in 1911. Since then city leaders have actively recruited private industry. The first was Seamprufe Manufacturing Company (later Komar Company), manufacturer of women's clothing, which began production in 1947. From that beginning, numerous other businesses and manufacturing plants have located in McAlester, broadening the employment base. 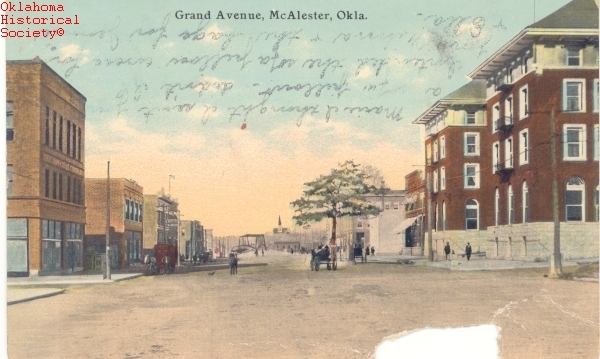 McAlester early developed a reputation for being a strongly Masonic town, particularly before and after World War I. One class numbered five hundred. The Scottish Rite Consistory dedicated its temple in 1907 and enlarged it in 1930, and it became one of McAlester's show places listed in the National Register of Historic Places (NR 80004521). In addition, in 1922 the International Order of the Rainbow for Girls was organized in McAlester, the location of its Supreme Temple. The downtown area was transformed in the 1960s and 1970s under the twin federal programs of Urban Renewal and Model Cities. Modern steel and brick buildings replaced many of the original stone business buildings. Reconstruction of streets, utilities, and low rent housing also occurred. The 1960 population stood at 17,419 and stayed consistent with a population of 17,255 in 1980. McAlester's Regional Health and Cancer Center has constantly expanded its disciplines as it served the community. Another McAlester facility is the Wanda Bass Higher Education Center, a branch of Eastern Oklahoma State College. Two widely known annual events exclusive to McAlester are the Italian Festival on the weekend before Memorial Day, and the "behind the walls" prison rodeo on the weekend before Labor Day. In addition, a large Miners Monument at Chadick Park is a fitting tribute to the industry that founded the town and a memorial to those miners who lost their lives in the hazardous occupation of coal mining. At the end of the twentieth century the town had fifteen properties listed in the National Register of Historic Places, including the Mass Grave of Mexican Miners in Mount Calvary Cemetery (NR 80003297). The 2000 U.S. Census reported 17,783 residents, and in the 2010 census McAlester had grown to 18,383. Gene Aldrich, "A History of the Coal Industry in Oklahoma to 1907" (Ph.D. diss., University of Oklahoma, 1952). I. C. Gunning, When Coal Was King: Coal Mining Industry in the Choctaw Nation (N.p. : Eastern Oklahoma Historical Society, 1975). McAlester (Oklahoma) News-Capital, Golden Anniversary Edition, 29 September 1949. Joseph B. Thoburn and Muriel H. Wright, Oklahoma: A History of the State and Its People, Vol. 2 (New York: Lewis Historical Publishing Co., 1929). Clyde Wooldridge, McAlester: The Capital of Little Dixie (Rich Hill, Mo. : Bell Books Publishing Co., 2001). Thurman Shuller, "McAlester," The Encyclopedia of Oklahoma History and Culture, https://www.okhistory.org/publications/enc/entry.php?entry=MC001.